With internal steel heat shield and steel reinforcements. Allows stowing of cleaning rod without drilling. We've been asked over and over for this piece. Here it is, the one you've been wanting all along. Impervious to moisture and common solvents, very tough and good looking. Though some fitting of the rear tenon may be required, it fits nearly all AKs having stamped receivers. This is the same forend that comes with the stock sets AKBSW and AKBSL. Fits nicely with the UltiMAK AK optic mounts M1-B & M2-B. 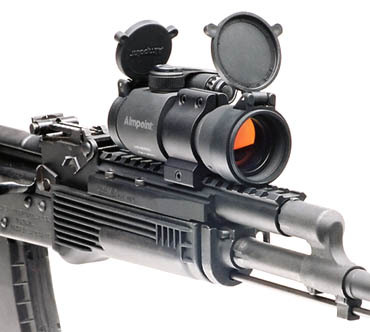 Shown here on a Romanian SAR-3 with UltiMAK M1-B optic mount and Aimpoint CompM2 military grade reflex sight. Because AKs are somewhat variable, especially in the barrel trunion area where the forend fits into the receiver, this forend is made on the large side at the rear tenon. Hence the need to file-to-fit in some cases.